Social platforms like Facebook and Twitter have become an important channel for companies across the globe, and especially so for ecommerce sites, as majority of online shoppers have a presence on Social Media. In India, ecommerce sites have been some of the most active users of Social media channels, be it for marketing their offers or to provide customer service. Indian Social Media research firm, Simplify360, released some insights into the numbers and engagement that various ecommerce sites provide – According to them, among all pure eCommerce companies, Flipkart leads in numbers, while Snapdeal leads when it comes to engagement. The numbers were arrived by Simplify360 based on the total number of organic and inorganic mentions, the fan size on Facebook, the number of people engaged, the number of followers and mentions in the last 30 days. 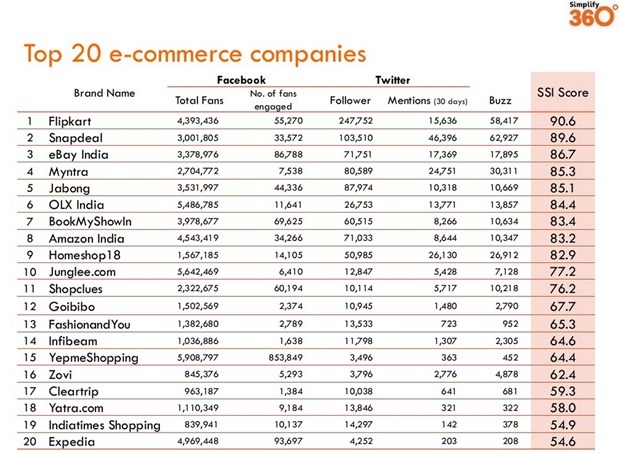 Simplify360 considered a total of 57 India ecommerce companies for this report. Flipkart led the pack with SSI score (Simplify360 Social Index) of 90.6. The SSI score is arrived looking at all the parameters including Facebook & Twitter fans, engagement and buzz. Snapdeal followed with a score of 89.6 followed by eBay, Myntra and Jabong. 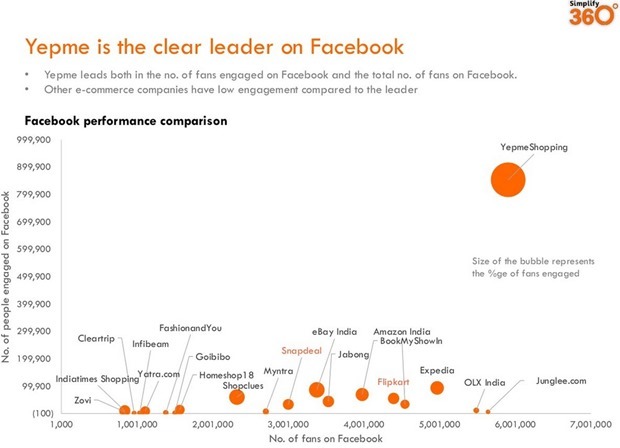 Purely in terms of numbers on Facebook YepmeShopping has the lead with 5.9 million fans followed by Junglee.com, Expedia, Amazon India and Flipkart. Even when it comes to engagement on Facebook, Yepme was far ahead of everyone else with 853k fans engaged. However, because of their dismally low score of Twitter they ranked only 15th best among all the players. When it came to share of voice, meaning the mentions by Social Media users, Snapdeal had the highest buzz in last 30 days. 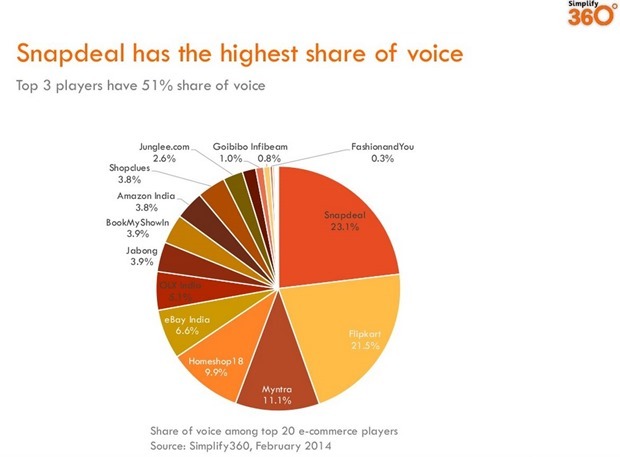 They accounted for 23.1% of share of voice, followed by Flipkart (21.5%) and Myntra (11.1%). Yepme Shopping, which recently converted into an aggregator rather than pureplay ecommerce site was far ahead of others when it came to number of fans on Facebook as well their engagement. It is quite surprising that they were able to keep more than 10 times the numbers of fans engaged as compared to Flipkart, Snapdeal and others. When it came to growth in Facebook fans, Flipkart and Snapdeal nearly doubled their total fan base in last one year. On the other hand, sites like FashionandYou, Infibeam, Cleartrip, Yatra and Indiatimes Shopping witnessed only a modest growth. Here is the entire report released by Simplify360. Very interesting and informative insight. Thanks a ton for sharing such a nice information. Well, its a brief summary. I am working in digital marketing field. What my chances to get employed in such companies? Also, what efforts one should take?? E-commerce has taken the world of retail by storm and captivated the imagination of an entire generation of entrepreneurs, with e-commerce ventures with various business and commercial models. The explosive growth in the last few years has already catapulted the biggest firms among these ventures past the billion-dollar territory. The sector has grown three times in four years to nearly 12.6 billion USD in 2013. Various industry estimates project that the sector will further growth five to seven times over the next four to five years. Online retail, while today representing a small fraction of the e-commerce space is one of the fastest growing segments. It is also the most challenging in fulfilling its fundamental proposition of transcending physical boundaries to deliver a variety of products to the customer’s doorstep. Logistics and infrastructure in e-retailing becomes the very backbone of the fulfilment network and the basis on which stringent service level expectations are set and met, and customer mind-space among competing alternatives is won. In India, these are arguably the weakest links, and therefore the enhanced need for greater attention and management bandwidth to these critical functions. As people are getting attached to the online world, entrepreneurs are finding new ways of attracting them to the websites. Crisp and sleek designs, meaningful and attractive content, and optimized websites target potential customers and reap huge profits. Promoting products and services through website is a buzzword today, and every Digital marketing company in India claim to generate maximum yield by innovative techniques. However, only a few of them really know the crux of it. It is important that the designers and developers understand digital marketing tools well.